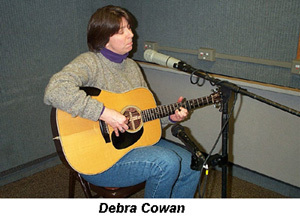 Deb Cowan says she’s loves to sing and, wow, can she. 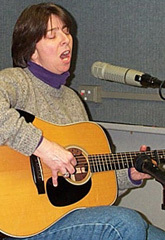 On this latest return visit to “Profiles in Folk,” she treated us to six sparkling songs (including a bit of nonsense) live in our Studio A along with fine insights into being a foremost interpreter of songs both old and new and how it all largely began with Maddy Prior and Steeleye Span and the Northwestern Renaissance Orchestra. Her latest albums are “The Songs and Ballads of Hattie May Tyler Cargill” with Acie Cargill and Susan Brown and others on Folk-Legacy Records and her own “The Long Grey Line” (www.debracowan.com). Our engineer for the night was Abe Lettelier. We finished up the night with selections from a relatively new album by Canada’s (via Scotland) Enoch Kent and a few traditional pieces an album released in 2001 celebrating the first 25 years of Britain’s Fellside Records.